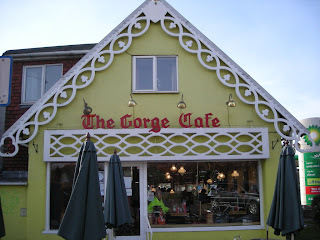 The Gorge Cafe, or just The Gorge, is a Reading institution. You can find it here. There's only one serious option if you ever have the (mis)fortune to find yourself in Reading and simultaneously in the mood for a fry-up. It is The Gorge. The Gorge has a almost religious following and many a reveller from the nearby Reading Festival campsite has been saved from a near death experience by their excellent food. It's only natural that their menu focuses on variations on the all day breakfast theme but that's not all they do. You'll find omelettes, jacket potatoes and much more to choose from. There's also options for the freaks, sorry - vegetarians, out there. You can add and remove items from your chosen fry-up as well. 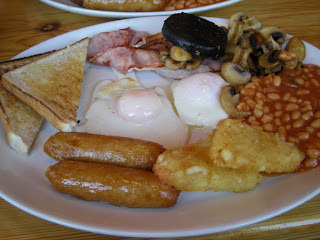 As you can see from my plate I went for the All Day Breakfast with added black pudding and mushrooms. The interior makes you feel like you are sitting in a cave, which is quite cool. Don't be surprised if it is full when you arrive - the place is very popular. Come down on a summer Sunday and you will almost not be able to make it to the entrance due to all motorcycles that are parked outside. Mikey's verdict: Go there and have a great fry-up! A All Day Breakfast with added black pudding and mushrooms. Yummy! 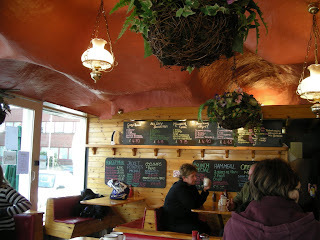 Interior shot where you can see the 'cave ceiling' as well as some of the menu options on the blackboards in the background. I thought I'd test out an idea for the Super Bowl Party that I'm holding next weekend. This might make it onto the shortlist.. Normally I would make my own barbecue sauce but I was feeling a bit lazy. Besides that, there was a bottle of barbecue sauce in the pantry that looked like it wanted to volunteer. Nuff said! 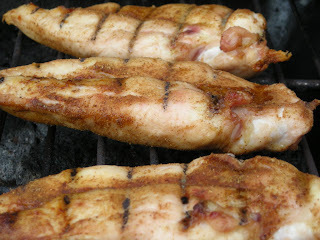 Rub the chicken breasts with the dry rub of your choice. Set the barbecue up for indirect cooking and get the smoke going. Cook the chicken breasts until done. Once done pull the chicken into smaller pieces. You can use two forks for this but I prefer to use my hands. Don't pull it to thin because then it just turns into mush when you put it in with the sauce. Pour the barbecue sauce (I used Southern Sunset Bar-B-Que Sauce from Roadhouse BBQ) into a pan and heat until boiling, reduce heat to a simmer. 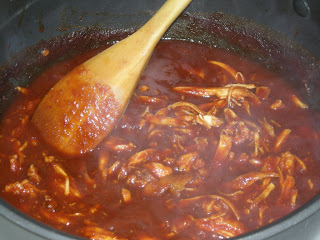 Once the sauce starts to thicken you can add the chicken pieces and let it heat through. Split the rolls and spoon up mixture and put the lid back on. I served this with twice cooked fries. 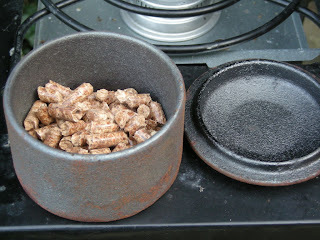 The cherry wood smoke pellets before being put into the barbie. Chicken breasts on their way to perfection. For those of you who are innocent enough not to recognise what this is: It's a kebab burger. Yes, you read that correctly. 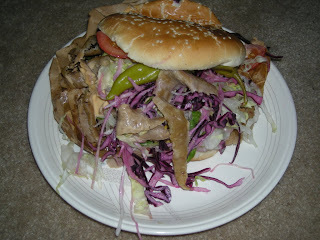 A kebab burger. It's exactly what it sounds like. Start with a 1/2 pound cheese burger. Then add doner kebab meat and various salad items. The best place to get this monstrosity is at Mr Peeps kebab van outside Reading University. Disgusting? Yes! Unhealthy? Yes! Against everything I believe in when it comes to food? Yes! A freak of culinary abnormality? Yes! Irresistible? Yes. I got woken up around 05:30 this morning, by the sound of sobbing. The sound came from outside my window, from the patio in the back garden. When I investigated what was making the noise I found out that it was my barbecue. It was feeling underused and neglected. So... Expect a recipe post tomorrow that at least in part necessitates the use of a barbecue. That should cheer the little rascal up a bit. Also, there should be a review of a legendary Reading eatery being posted on Sunday. 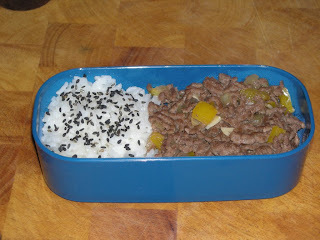 I must admit that this Bento reeks of lack of imagination, but at least it should be fairly filling. 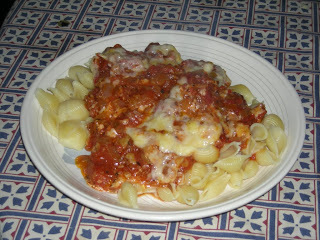 As you can see the main part of it consists of leftover pasta from yesterdays post. Fruit and veg is provided with some carrot and dried bananas. 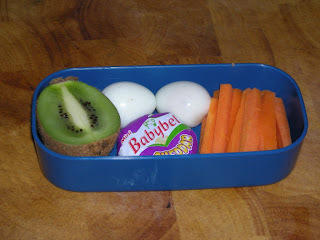 One thing of interests is the muffin trays that I put the carrot and banana in, they're made of silicone and not paper. That should mean that they are a bit more environmentally friendly, since I can re-use them, and that they should be much more resistant against moisture. That should keep foods like dried bananas from turning mushy. 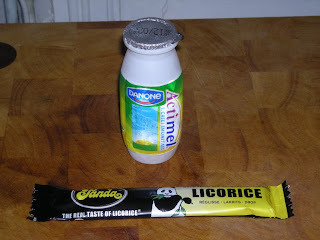 As always there's a bottle of Actimel too. 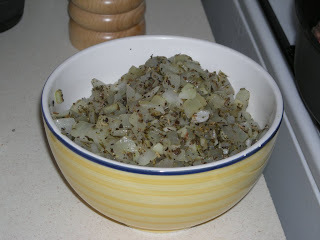 Start by sweating the onions and garlic until translucent together with the herbs. Add tomatoes, water, vinegar, sugar, salt and pepper. When this mixture boils, lower the heat and let it simmer. Let it simmer until it has reduced to the consistency that you want. Heat the grill to medium. 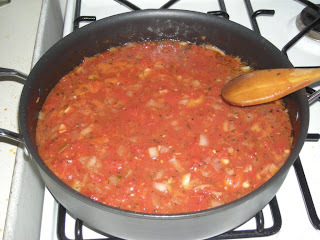 Once the mixture in the pan has the desired consistency pour it into a heat resistant bowl or similar. 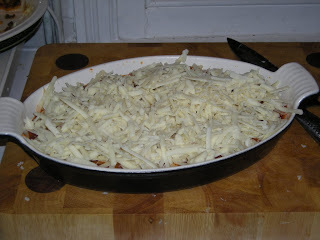 Mix in the meatballs and top with the grated cheese. Let it stay under the grill until the cheese is bubbling and has a nice colour. Waiting to get under the grill. The grill has performed its magic and it's ready to get plated. I just had part of my latest order from J-List turn up at work. 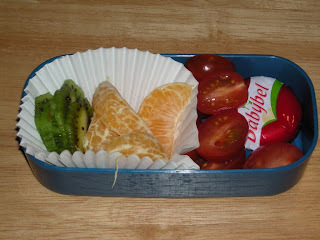 There are some cool stuff, mainly for Bento making, in this one. I'll post pictures when I get home. 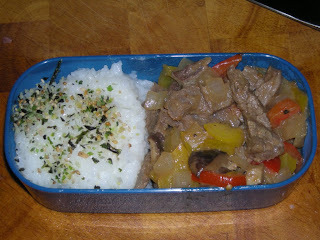 In this picture you can see my new aluminium Bento box. My crab, tulip and penguin wiener cutters. 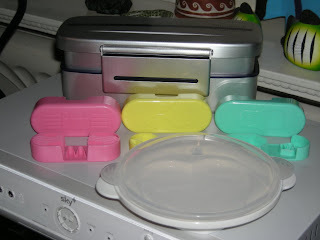 Last but not least, there's also my microwave heart shaped egg maker. I was thinking of making burgers for my sport-a-thon but felt that would be a bit common. 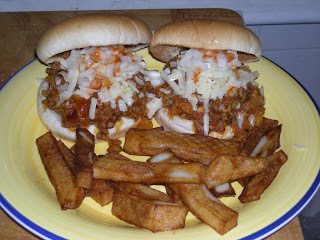 So, Sloppy Joes it is instead. Start by sweating the onion and garlic until they are translucent, adding oregano half way through the process. 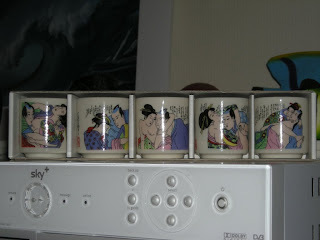 Once translucent, put to the side and reserve. 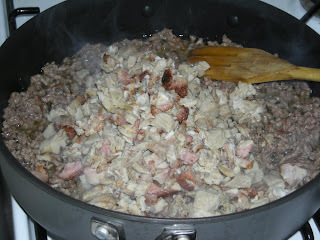 Then start browning the mince, adding the pork once the mince is browned and most of the liquid from it has evaporated. 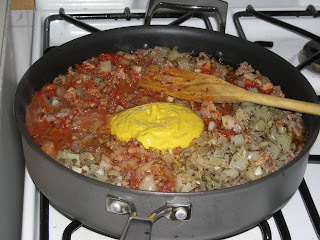 Add tomatoes, vinegar, water and mustard. Stir well to combine. Let this mixture simmer away until you it has reached the consistency you want. 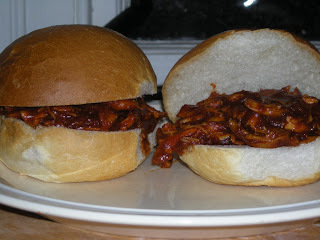 Serve it by putting it on the grilled buns, topping with cheese, onion and hot sauce. The onions are sweated and ready. Just waiting for the mince to get it's arse into gear. 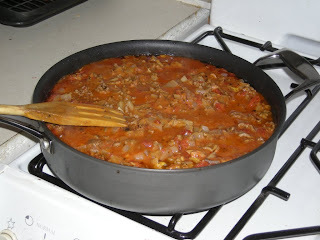 The mince is done and the pork just jumped into the pan. The wet ingredients have been added and it's time to stir things up. 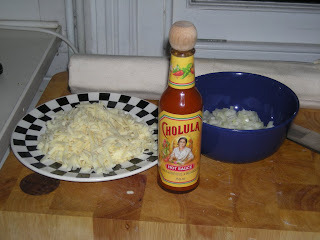 The sides, including the lovely Cholula. Due to various reshuffles in the house I live in I will now end up with a proper satellite receiver and what looks like every movie and sports channel known to man, or at least man in England. I'll be moving tomorrow, Saturday, so I won't have much time to chill in front of the TV but I'm making sure to recoup that on Sunday. This is my planned viewing schedule for Sunday. Some people might think of this a tad bit excessive but they just don't know how long it has been since I could watch a NHL game at a decent time of day. What does this have to do with food? Everything! I'm currently trying to figure out what to cook for myself as I enjoy this sport-a-thon. The usual suspects do pop up. Chicken wings, pizza, chilli and so on. There will probably be some beer-age too and I can't see myself watching this without some peanuts, popcorn and so on as well. 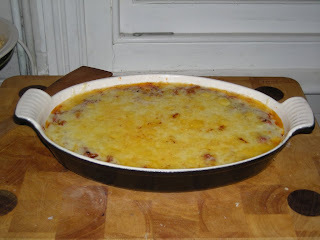 Does any of you readers have any ideas, links or recipes that you'd like to share? Ice hockey puck shaped cookies perhaps? 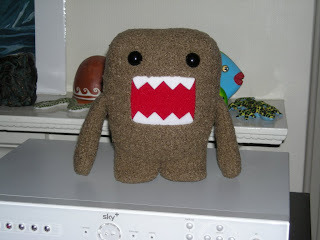 I haven't been able to tell you about this until it all was signed but I'm now a Featured Publisher at foodbuzz.com. You can find my profile here. It's a great site so make sure to visit it and have a look around. The British pub chain Wetherspoons recently announced a limit of two alcoholic drinks for parents who brings kids to their pub. You can read more about it here, here and here. This has been heavily debated, in media as well as 'around the water cooler'. I just thought that I would add my two pennies worth to the debate. I do think their decision is a very good decision. Pubs are very rarely a good environment for kids, although the smoking ban has improved the physical environment for them. Earlier you could see parents sitting in the pub, happily puffing away on their cigarettes with their babies in prams next to them. That's a sight that always managed to piss me off. The poor kids had not asked for that. As a kid you are more or less constantly embarrassed over your parents. Having to sit in a pub and watch your parents get more and more drunk and behaving like idiots does not make that any less of an issue. Although I would never condone, more about that in another rant later, eating in a pub I can somewhat understand parents taking their kids there for a cheap (and nasty) meal. What I can't understand is parents spending an entire day down the pub getting more and more drunk with the kids showing ever more despair in their eyes. It's not just the parents drinking and (mis)behaviour that affects children in a pub. There's also the rest of the customers to take into account. Wetherspoons have historically not been showing sports in their pubs so they are a bit exempt from my next example. I know that myself, and many of my friends, do not set the best examples whilst watching sports in a pub. Put on a football (soccer for my friends across the pond) match and the language goes well south. Everything from the provenance of the referees mum to the sexual habits of the opposing teams players are being discussed. These discussions are normally very loud and peppered with some very inventive cursing. I know fully well that most kids are well versed in the noble art of swearing from a very tender age but there's no need to bring them to the pub to enhance their vocabulary. To conclude, I fully support Wetherspoons decision to limit parents to two alcoholic drinks per visit if they have their kids with them. If I had my way the kids should not have to spend time in a pub at all. There are far better establishments to bring your kids to for a nice and cheap meal than a pub. And no, I'm not talking about BK or Mackie D's. 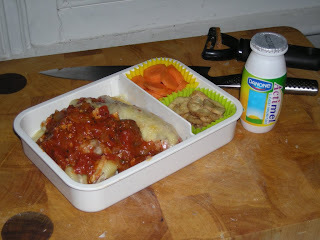 This time it is a Bento with a slightly Moroccan/Middle Eastern twist. 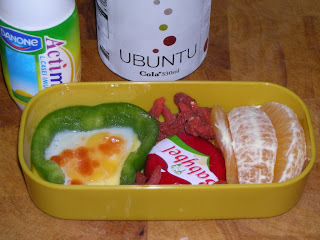 In the upper tier we find a Babybel cheese, some sun dried Goji berries, a couple of segments of Minneola/Tangelo and the strange looking thing furthest to the left is a Quails egg fried in a ring of green pepper. Arty, eh? ;) If you wonder what the 'red blobs' on the yoke is - it's Tabasco. In the background you can see my bottle of Actimel as well as a can of Ubuntu Cola. Ubuntu Cola is the worlds first Fairtrade cola and well worth trying, if nothing else just to support Fairtrade. It tastes a bit like Jolt Cola, at least that's what I think. The Moroccan/Middle eastern twist comes in when you look at the lower tier. 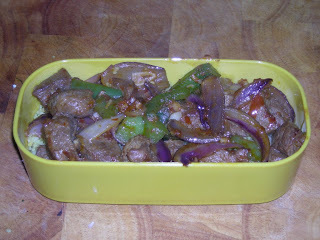 I diced some leg of lamb, cut up red onion , green pepper and garlic. This was marinated with rose harissa and olive oil and then fried. It's put on a bed of (I sound like a wanky restaurant menu now) of lemon and coriander flavoured couscous. 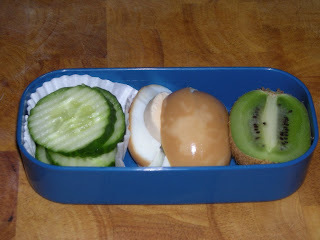 The upper tier consists of half a Kiwi (I'm not buying such a big pack of them next time), some carrot sticks a Cheddar Babybel and two hard boiled Quail eggs. I've never tried Quail eggs before so that could be interesting. In the lower tier I've put two rice rolls with some seasoning in the middle of them. 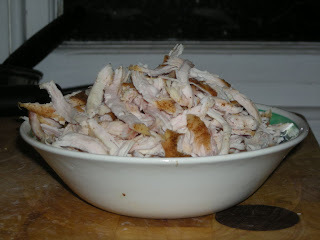 For the meaty part I took some Turkey breast and went postal on it with a meat mallet until it was nice and thin. 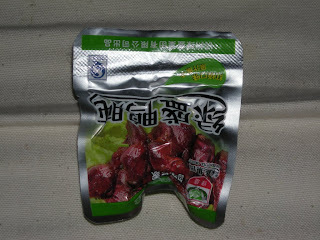 I cut that into smaller pieces that were marinated in Teriayki marinade, Sake and some chilli sauce. A quick visit to the frying pan later it was ready to get into the box. 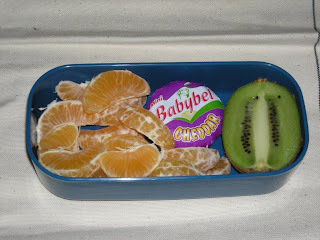 The upper tier consists of half a kiwi, some clementine and a Babybel cheddar cheese. Lower tier has a quick stirfry made with beef, onion, garlic, red and yellow pepper, shiitake mushrooms, chili and flavoured with lemon soy sauce and some pepper. 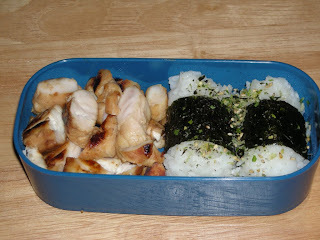 To partner this I made some normal sushi rice. 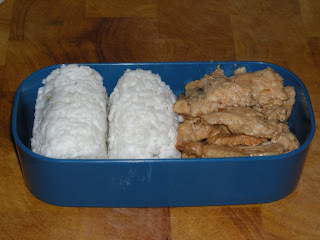 The strange treat is a bit of a mystery but I believe it might be fried chicken liver. Update: Yes, it seems to have been chicken liver. 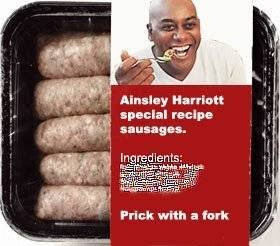 Tasty though. Lower tier: Fried chicken breast that has been marinated in garlic and chili. Rice rolls that has nori around them and are sprinkled with some Nozawana Furikake "Hokoyo" Rice Seasoning.